In 1986 Geraint James, head of the Design and Creative Arts Faculty at Eirias High School in Colwyn Bay, was appointed as Musical Director. Under his leadership the choir competed in the Royal National Eisteddfod in Porthmadog and won the first prize in the Class ‘B’ competition between 41 and 60 voices). 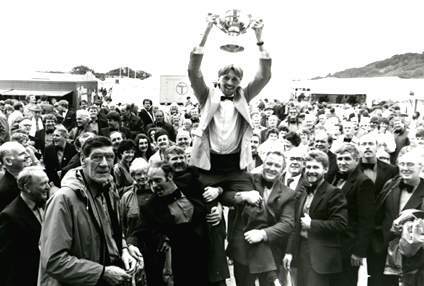 Victory here meant that between 1976 and 1987 Côr Meibion Colwyn had won all three classes of male voice competitions at the National Eisteddfod of Wales (the only choir in Wales to have so far achieved this). In June 1988 Roby E Davies, a successful Composer, Arranger of Music and Organist at Llanrhos Parish Church, joined the choir as Deputy Musical Director. Also in 1988 Gordon Lorenz contacted the choir asking if they would like to take part in a recording he was making to celebrate 250 years since John Wesley’s conversion. 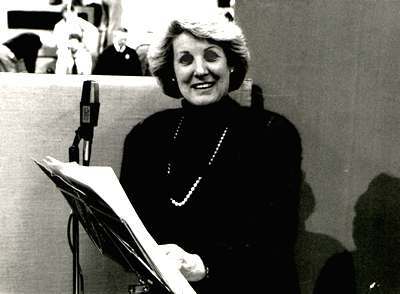 The soloist was Moira Anderson, the popular and highly regarded singer and television personality. The Alan Simmons Singers, who were a regularly featured mixed choir on BBC radio and television completed the line up of musical talent that was to perform on the recording. The album was recorded in the superb acoustics of Huddersfield Town Hall, and was completed in one day. A total of 14 tracks were recorded, and all the hymns on the album were written by Charles Wesley. The album, which is called “Tribute to Wesley”, is available on the Kingsway Label (No. KMR484). 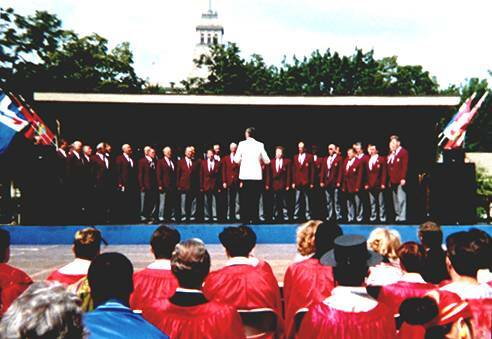 In June 1989 the choir undertook another overseas trip to Canada where they represented Wales and the St David’s Society at the annual Toronto International Festival. In August the same year the choir took part in the premiere of a new and specially commissioned Opera “Dagrau Pengwern” (by Geoffrey Thomas), supported and introduced by the late Sir Geraint Evans and staged at the National Eisteddfod in Llanrwst. 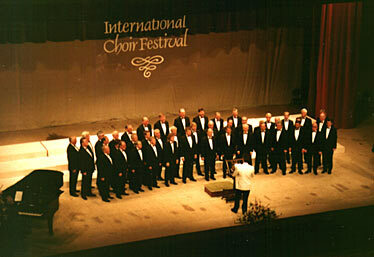 For a short period the choir was under the leadership of Gareth Hughes in which time the choir competed in the 5th Malta International Choir Festival in 1993, and returned with a Bronze award from a competition with choirs of a very high standard. The Gold award winners were the Moscow Engineering and Physics Institute Male Choir. 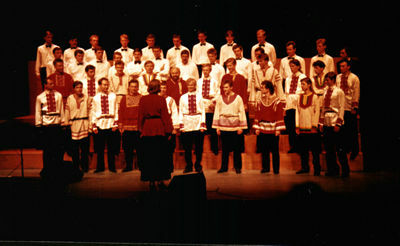 A friendship was nurtured and in 1995 the Moscow Choir visited Wales and a successful, if not eventful joint concert was held in the Rhyl Pavilion. On the night of the concert, Rhyl and the surrounding area experienced the worst thunder storm in years. While Côr Meibion Colwyn were singing the line “…when darkness fell on the earth…” (from Willy Richter’s “The Creation”), an enormous lightning strike hit the area and all the lights went out. The safety curtain dropped in front of the stage, but the choir, determined to soldier on, continued singing in complete darkness to a capacity audience while the stage staff held torches for the Musical Director and Accompanist. The concert was a resounding success despite the weather. The next Musical Director was Ian Woolford, an accomplished baritone soloist who was himself a chorister. 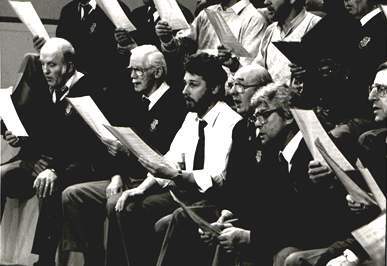 Under his leadership the choir gained from his experience as a voice teacher and the repertoire was enhanced with some traditional male voice choir ‘Standards’.